Premium window treatments by C'È LUCE - curtains & drapes, window valances, swag curtains, swags and valances - are designed to make the lasting tradition of classic draperies accessible to modern homes. 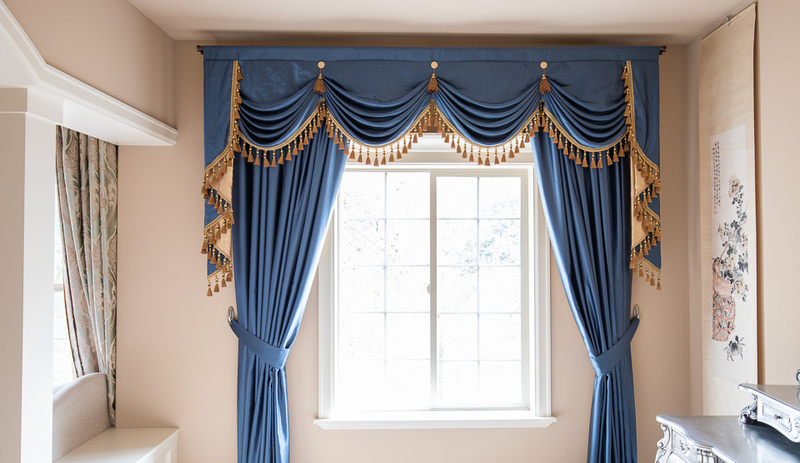 High end quality, timeless classic design, and meticulous craftsmanship lead to these luxury swag valance window treatments, customized especially for you, to lighten up your home with a touch above ordinary---the statement pieces you've been waiting for. The quality is guaranteed. You can order fabric samples at our fabric gallery before placing an order. We often recommend our first-time customers to order one set of in-stock or custom curtains first to exam our product quality. Once you are happy with the look and quality, you can easily order more curtains to fit windows of different sizes. Please note that all our custom orders are made to measure so they are subject to our return/exchange policy. However, if it is due to the quality of our product, we offer free exchange until you are satisfied with your order.